Prior to the release of Goodreader 4 the original Goodreader got a major update in line with iOS 7. The makeover resulted in a more streamlined look and faster processing. One other thing I loved most about Goodreader is that compared to dedicated PDF readers/annotation apps, Goodreader is the easiest and simplest to work with. The same ease and functionality can be found in Goodreader 4. 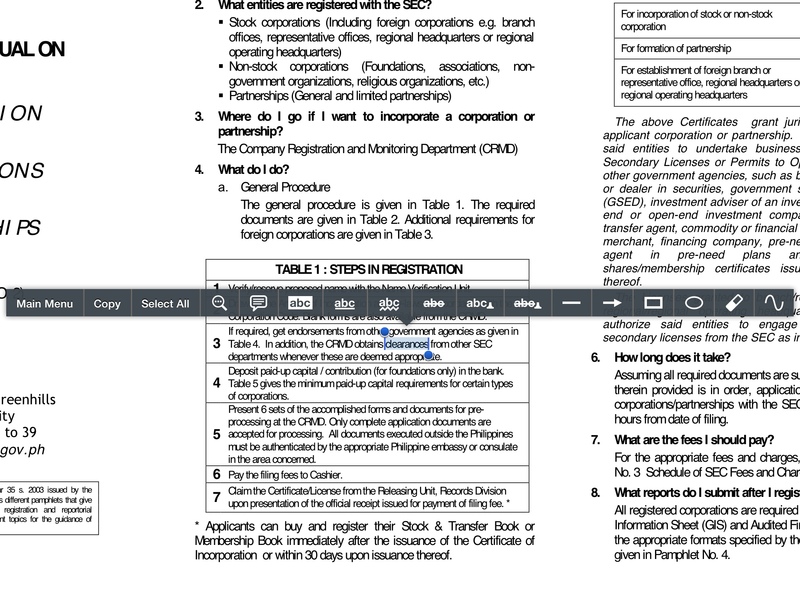 Marking up PDFs is pretty easy to do and tapping and holding the screen brings up different options for marking your text or putting a comment/sticker, etc. This is an intuitive process that lets you keep reading and doing what you need to do, instead of a complicated toolbar (often found in the PDF readers I've tried) with too many markers and colors that are well-meaning sometimes get in the way. Goodreader 4 is an incredibly versatile app that handles different types of files, as well as different ways ot moving your files around from your iPad to your computer. My favorite way of transferring files is via Wifi, which lets me upload/download files to or from my iPad, to my Mac. 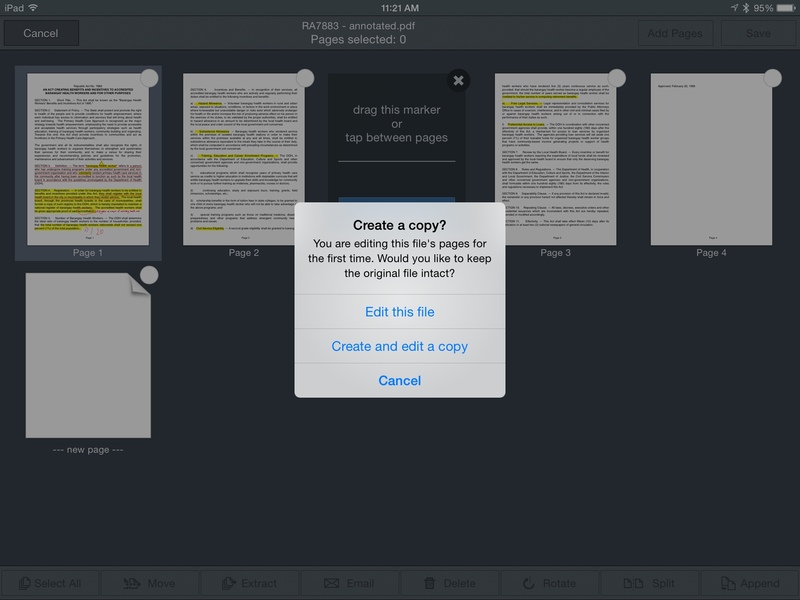 You can also upload your stuff (not just PDFs or photos, mind you, but any files you put in your Goodreader app) to the cloud, and other servers. For basic users such as myself, the wifi transfer process is a lot easier than doing it via iTunes, especially if you don't have much time to sync between devices. 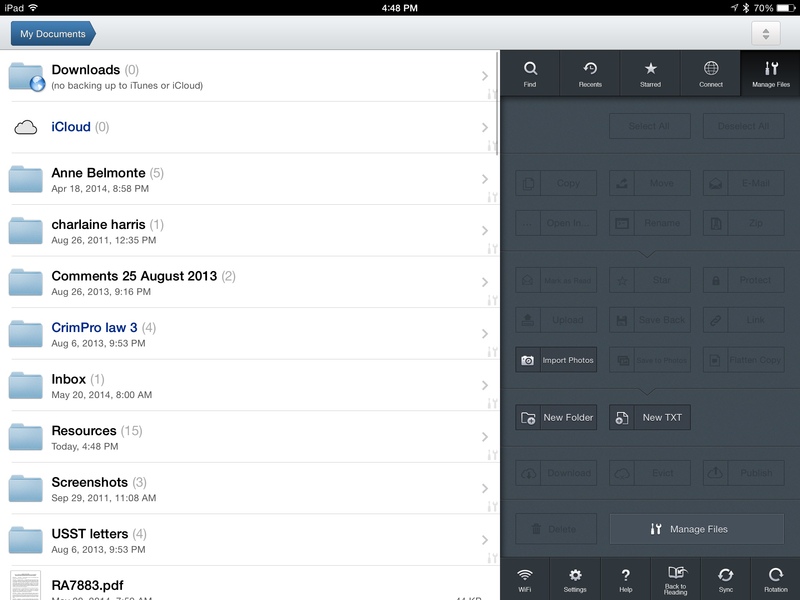 Goodreader 4 is also a good way to put together multiple files in folder for easy email and uploading. Since it works with most apps, you can just select the option “Open in …” from your app and choose Goodreader 4 From here, you can manage your files – create a folder to put your files together, compress or zip these files, import photos, etc. The screenshot above shows these different options. If you're a heavy PDF user, I personally find Goodreader 4 as one of the best and most functional PDF annotation and readers out there. 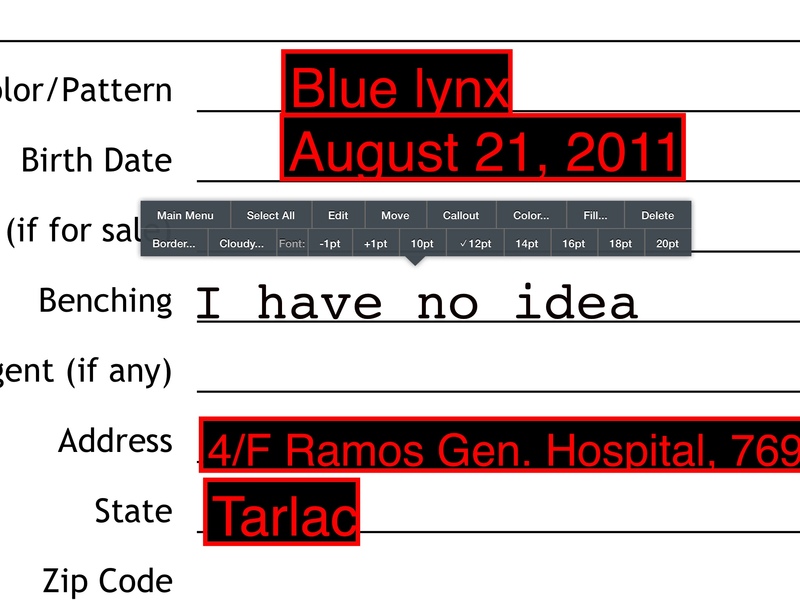 It does away with a number of fancy brushes or colors, and instead focuses on basic functionality. In addition, what I like about it is filling up PDF forms which is pretty easy and intuitive to use. In particular, I like that you can also easily resize selected text just by pinch to zoom, aside from setting the actual font size. This is a neat feature that we take for granted but in the other PDF annotation apps I have used, there isn't such a feature. You can also create your own PDF or text file. Creating your own PDF means, however, that whatever you do is contained in editable boxes. Once you're done, however, you can 'flatten' the annotations (this is so that when you view it, you don't accidentally edit or delete these editable boxes) or send the file as is if you want another person to edit it. 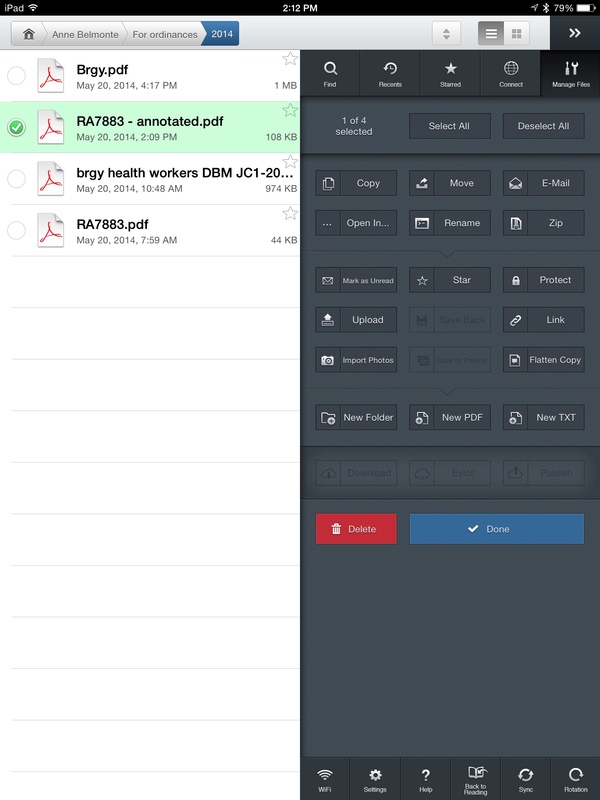 One of the new features in Goodreader 4 is the ability to directly manage your PDF. When I found this feature, I wanted to ask, “Where have you been all my life?” since I've been looking for such a feature for a long time. 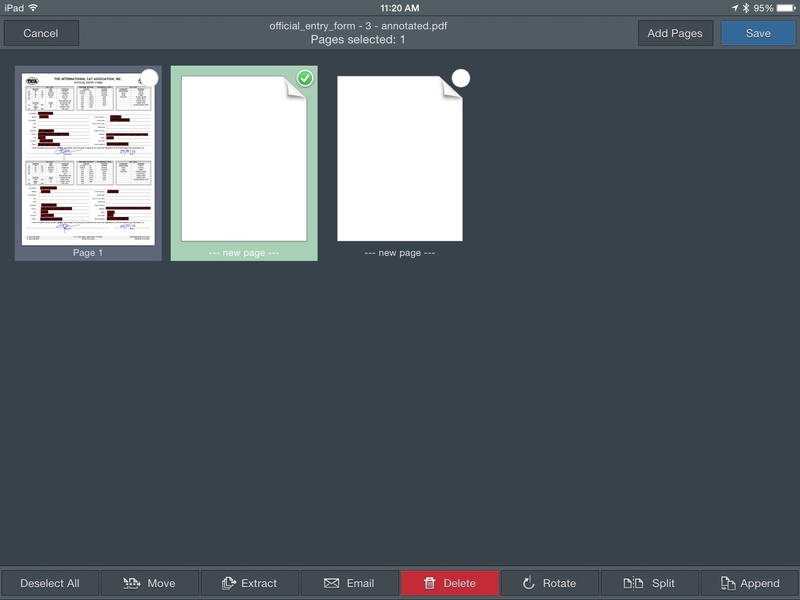 This feature is especially useful when you have a PDF with the pages out of order, when you want to split up a big PDF file into smaller, more manageable chunks (split function), insert pages for your own notes and comments, move pages around, etc. You can even add other PDF files to the one you're working in – especially useful in my case since I have a marked up file and a separate one with my handwritten notes. For those who don't have Goodreader yet, Goodreader 4 is an effortless recommendation. However, the big question for existing Goodreader users such as myself, is the upgrade worth it? Honestly, it took me some time to find new features in Goodreader 4 that weren't in Goodreader Other than PDF management features, the features I've talked about can be found in Goodreader The user interface is nearly identical, and I found my most-used features intact. The additional features such as PDF management are quite subtle and easy to miss especially if you're not expecting these new features. Another is that with an excellent original app to begin with, Goodreader 4 has big shoes to fill, and existing users will want new, mindblowing features. Incidentally, should you decide to upgrade to Goodreader 4 from your existing app, the Migration Assistant is an excellent feature that lets you port over your stuff smoothly and easily. Just follow their instructions carefully to avoid data loss. That said, it really depends on your needs. If you're a casual user of Goodreader in general, you can stick to your existing version and hold out until you see more new features. However, please take note that with the release of Goodreader 4, the developer will stop updating the original Goodreader for iPad. (It's good of the dev, however, that Goodreader was updated several times just before launching Goodreader 4, keeping the app in good condition). If you're a moderate to heavy user such as myself, and would like a single app that also works for your iPhone, I suggest you consider upgrading. On my part, I personally need the PDF management feature since I often receive scanned PDFs that are sometimes incorrectly paginated. Also, the idea that I can do more with a PDF file in one single app rather than switch between different PDF apps for certain features is a major factor. With the upgrade price for a universal app at 60% off, it's really not a problem to recommend the upgrade, especially if it's in support of an excellent (indie) app. I think if you’re an easy client of Goodreader all in all, you can adhere to your current form and hold out until you see all the more new peculiarities. Nonetheless, please observe that with the arrival of Goodreader 4, the designer will quit redesigning the first Goodreader for ipad.